Every year for the week of Valentine’s Day, Jacob’s school has a Heart Art Sale. All the kids in school create a special piece of artwork (thanks to the amazing teachers!) and the art goes for sale to the parents for $5 each. As part of this sale, the kids learn about what philanthropy means and the proceeds are donated to a charity. This year, Jacob’s school surprised us in a BIG way. They decided to donate all of the proceeds from the Heart Art sale to the Rallying for Red Phoenix fundraiser! They even bought Jacob’s artwork for us! As if that isn’t enough to make me cry, an anonymous donor asked to match all of the proceeds from the sale. Wow. There are no words to express how this has made us feel. His school made us promise not to use the money towards any adulting – just something FUN for our family. They even suggested a weekend away at the beach – how perfect does that sound?! Throughout this entire week, the school celebrated Spirit Week. They wore a different color each day and learned what it means to be a philanthropist. They have spent the whole week decorating the school with all of the art they have been working on this week, as the Heart Art artwork pieces are sold. 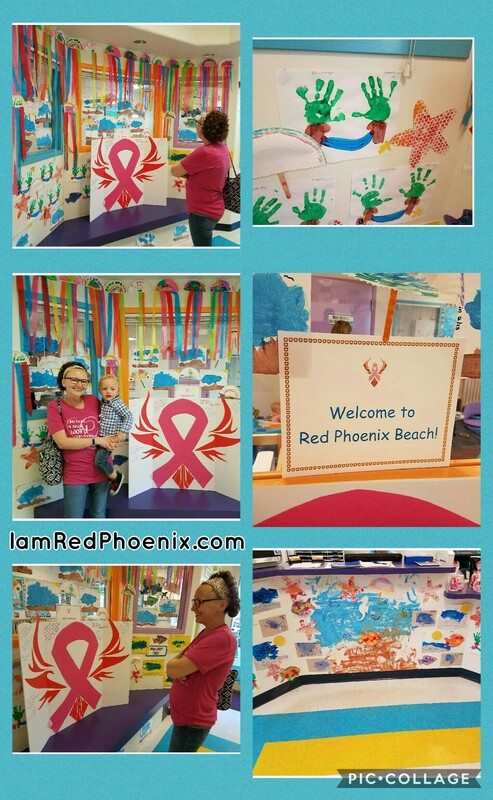 On Thursday, we picked up Jacob to find that the entire lobby was decorated as the Red Phoenix Beach! Each classroom chose a different piece of beach themed art to make and each child created their own masterpiece. They took all of these amazing pieces of art and created a beach – just for me. And wow, is it incredible. The imagination, the vision and the depth of dreams that these children have is amazing. Truly amazing. Then there was today. The color of the day was green and it was Red Phoenix Day! 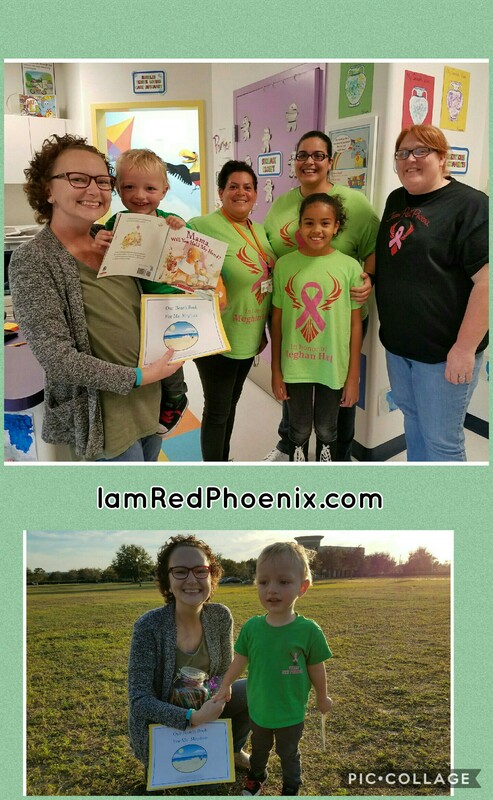 Everyone wore green – many even wore a Red Phoenix shirt! Walking into the school today, I couldn’t help but smile with tear filled eyes. Seeing the incredible beach pictures, the art work made by all of the different classes and everyone – kids, parents & children – wearing GREEN…for me. Every time I thanked someone they responded by telling me that they should be thanking me, for being an inspiration to them. I’m just me. It’s you all that are so amazing. Picking up Jacob tonight, the director stopped to tell us that she had a surprise for us and to stop on the way out. After picking up little man from the playground, we headed back to the lobby. There, the director came out of her office with a jar and two books. The Jar. She shared that the jar is a Love Jar for us, from all the kids in the school. It is filled with paper that is cut into the shape of mason jars and each child in the school decorated their own jar with their fingerprints or drawings or hearts or words just for us. The title of this post? One of the awesome jars I found in there. The Beach Book. They made “Our Beach Book For Ms Meghan”. It’s filled with beach scenes, made with love. There are beach chairs, boats, fish, sharks, crabs, palm trees, lots of sand and the sun too. It’s…perfect. Amazing. As I hugged each of these incredible women, I couldn’t help but wonder how we ever became lucky enough to find this school. Not only do they adore Jacob and treat him like their own, they are unbelievably kind to us as well. They are a part of our family and a reminder of just how blessed we are.